"With only half a lasagna noodle per serving, this is sure to satisfy a lasagna craving for those watching their carb intake. Serve with a salad for a complete meal. Leftovers hold up nicely." Bring a large pot of lightly salted water to a boil. Cook lasagna noodles in the boiling water, stirring occasionally, until tender yet firm to the bite, about 8 minutes. Cut each noodle into 4 equal pieces. Preheat the oven to 350 degrees F (175 degrees C). Line a large baking sheet with aluminum foil; place bell pepper halves on top. Bake in the preheated oven until peppers soften, about 20 minutes. While peppers bake, heat a large skillet over medium-high heat. Cook sausage and onion until browned, about 8 minutes. Add tomato sauce, garlic, and oregano and bring to a simmer. Simmer until thickened, about 5 minutes more. Remove peppers from oven and pour off any excess liquid. Leave oven on. Whisk ricotta cheese, egg, Parmesan cheese, and basil together in a small mixing bowl. Layer each bell pepper half with 2 tablespoons sausage mixture, 1 noodle piece, and 1 tablespoon ricotta mixture. Repeat layers and sprinkle mozzarella cheese on top of each pepper. Place stuffed peppers on the baking sheet. 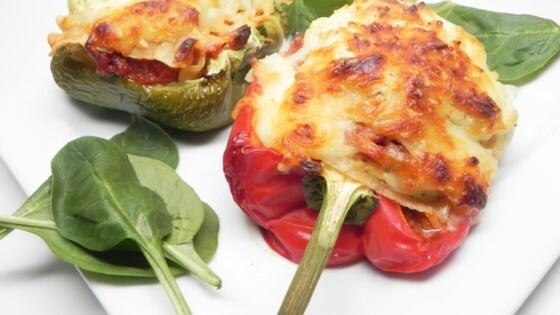 Bake stuffed peppers in the preheated oven until cheese is browned and bubbly, about 25 minutes. You can use any color bell pepper you prefer. I like to mix it up with red and green for the holidays. great flavor s. even GF if made without pasta. So good almost got the kids to eat a pepper. Delicious! Way more stuffing than the peppers would hold so I also ended up with a mini-lasagna. Italian sausage adds a little kick but i would recommend a dash of red pepper flakes. I also used Red Peppers which give it a sweeter taste. Everyone loved it.